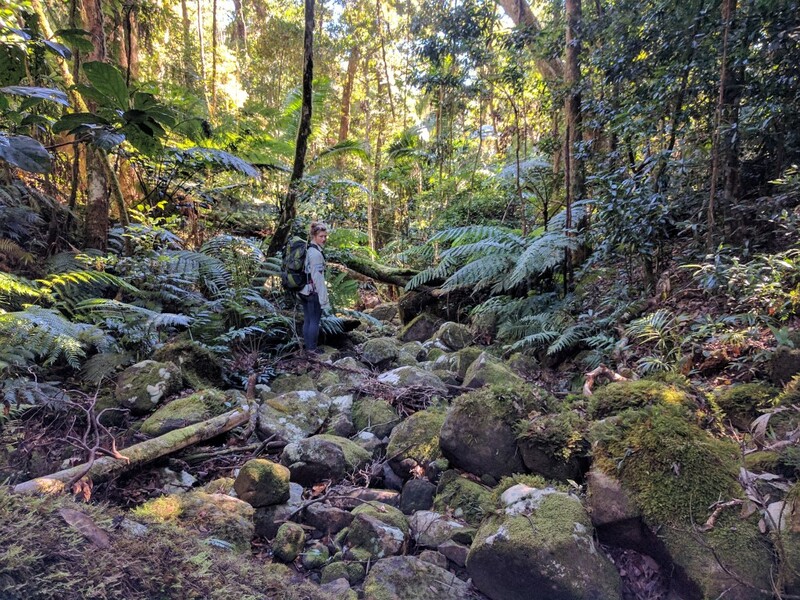 The Bowling Green Bay National Park (near Townsville) is a southern outlier of the Wet Tropics bioregion and has rainforest growing at its summit as well as along the various creeks. Hiking to the summit of Mount Elliot, Bowling Green National Park is a two dayer trip. Alan Simet, a well known adventurer in his 80's who has summited Mt Elliot 39 times throughout his life, has told me that the prettiest way to get there is via the Terraces; which I happen to agree with. We started at Mountain View Lake Eco Park (where the Palm Creek Folk Festival is held) and rock hopped up via the "Terraces" (St Margaret Ck), past "high camp" as far as we could, taking one right fork, until we hit a massive cliff and waterfall, from there we climbed up to the right and along the ridgeline and then up onto the flat summit. We ended up camping up a few hundred meters away from the very peak because it was getting too dark to go on and we didn't want to walk with our headlights this time. In the morning we made our way to the summit. Not much of a view, as expected, but the creeks are spectacular. The top is still battle damaged from Cyclone Yasi which makes it slow going as the vines have overgrown patches south of the summit. After that, we headed down Alligator Creek going bush at the top of the alligator creek falls and back down into the creek and along the walking track, seeing wild horses and a kite along the way. In the 80s and 90s, this route was a popular and one of the easiest ways to the top of Mt Elliot with the Townsville Bushwalking Club. You simply walked up to the saddle between the two peaks and turned right. It has been done in a day. Start at the recreational area at Alligator Creek to the base of the Alligator Falls, followed by a steep climb up the falls. It's an easier way to overcome the initial steep climb to 500m that surrounds the whole mountain than coming from Cockatoo Ck. However, Cockatoo Ck is more interesting than the climbing the grasslands around Alligator Creek Falls. If you do summit Mt Elliot from Alligator Creek, there is a massive patch of wait-a-while well above to main falls which you will have to cut your way through. The crazy way to summit Mt Elliot is via cockatoo creek. Follow the creek up past cockatoo rock (a monolithic looking, huge rock above the exit of cockatoo gorge) and then up the ridge towards the summit. There are HUGE boulder fields near Cockatoo Ck that make this journey interesting. TIP: Overnight on a bare rocky place called Cockatoo Rock with views to the Burdekin at about 1000m. The Northerlies are a warm and moist winds which, I suspect, is why the Northern side of Mt Elliot has denser vegetation. Cockatoo creek and its tributaries have must have much more rainfall that Alligator Creek as the sides of Cockatoo Creek have more rainforest and then the dryer sides of Alligator Creek. Major Creek and Cockatoo creek form a straight line and cut the massive mountain into two. The valleys are filled with Lantana and Lawyer Cane. Be extra prepared when hiking from this direct and allow several days. Look up a bare spot on the maps and plant to overnight there - view onto Townsville or view more towards the south. Secateurs came in very handy on this hike, often the pace slowing down to a halt as I was cutting my way through lawyer cane and vines. It was a long but rewarding hike. The best time to attempt this hike would be the dry season, observe the remnant streams. The riverine leaf-tailed gecko (Phyllurus amnicola) are endemic to the boulder-lined creeks of Mt Elliot at altitudes above 400m above sea level. Mt Elliot and it's entire mountain range is also home to two other endemic herptiles; the skink Glaphyromorphus clandestinus and the southern-most occurring Australian microhylid frog Cophixalus mcdonaldi. These three herps lies within the boundaries of Bowling Green Bay National Park. Water containers. Water to be collected from the creeks. Treat to sterilize (boil, UV, chemical, or filter). Cooking utensils, gas stove. Open fires are prohibited. A small trowel for burying faecal waste. Bury human waste and toilet paper at least 15 cm deep and 100m from camp sites, tracks and watercourses to guard against pollution and the spread of disease.